The Contractor of the Year nomination is a testament to the hard work, talent, and dedication of each of our employees and the core values they represent every day serving our customers. NT Concepts was selected as a finalist for both the Contractor of the Year ($75-300 million) and the Executive of the Year ($75-300 million) categories for the 14th Annual Greater Washington Government Contractor Awards™ presented by the Northern Virginia Chamber of Commerce and the Professional Services Council. NT Concepts is also in the running for Program of the Year for its extraordinary efforts providing investigative support services to the Office of Personnel Management (OPM). The GovCon Awards honor the leadership, innovation, and commitment to excellence in the government contracting community. NT Concepts and Founder/CEO Michele Bolos were selected respectively from a large pool of distinguished corporate and executive nominees by a panel of industry and government professionals. "It's a great honor to be selected as one of the top government contracting companies in the Greater Washington region, and we're thrilled to be included with such an impressive list of finalists. The Contractor of the Year nomination is a testament to the hard work, talent, and dedication of each of our employees and the core values they represent every day serving our customers," said Craig Reed, NT Concepts President and COO. "I'm equally excited for the nomination of Michele Bolos for Executive of the Year," Reed continued. "Michele created and perpetuates the positive NT Concepts culture, and leads by example through our core values and her service to the community. Her personality and leadership style are the foundation for our success." This is the second consecutive finalist selection for the company—in 2015, NT Concepts was a finalist in the GovCon Awards Contractor of the Year ($25-75 million) category. Presented by the Northern Virginia Chamber of Commerce and the Professional Services Council, the Greater Washington Government Contractor Awards™ is the premier awards event for the Washington, DC area government contracting community. Presented annually, the awards recognize outstanding achievement by companies and executives during the past year. The winners will be named at a November 1, 2016, gala dinner at the Ritz-Carlton Tysons Corner. 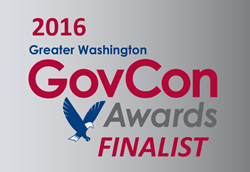 Complete information about the Awards can be found at http://www.novachamber.org/northern-virginia-chamber-psc-announce-2016-greater-washington-government-contractor-awardstrade-finalists.html. NT Concepts is an IT and business operations innovator focused on supporting a high-performance Government. We deliver the leadership, staff, technology, and processes to run and maintain complex government investigative service operations, helping our clients accomplish their missions with the highest degree of accuracy while reducing costs. We develop technical solutions such as business intelligence dashboards, web portals, and geoanalytic tools in secure enterprise, cloud, and mobile environments, providing powerful visualization and 360° situational awareness. Founded in 1998 and headquartered in the Washington DC metro area, NT Concepts is a privately held mid-tier company with customers spanning the Federal Civilian, DoD, and Intelligence Community markets. Visit us at ntconcepts.com and follow us @NTConceptsInc.